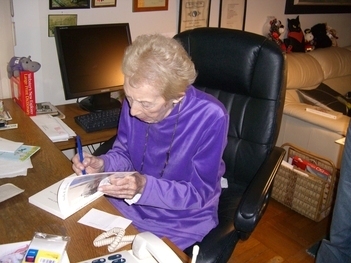 Stella Hershan über ihr Leben und ihre Erfahrungen im Projekt "A Letter To The Stars". Since 2003, over 45,000 students along with hundreds of teachers from all over Austria have been working to research and document the individual biographies of the Austrians who were murdered during the Holocaust and as well as the Survivors of the National-Socialist regime. For the invitation project 38/08 on the occasion of the 70th anniversary of the annexation of Austria to Hitler’s Third Reich, we are extending an invitation to the people who, beginning in March 1938, were persecuted. Humiliated, and driven away from Austria or interned in concentration camps to visit their old homeland. I stared at the letter. March 11th 1938. The worst day of my life. I was 23 years old and married for five years. And I had a baby, my seven month old daughter, Lisa. We had a beautiful apartment in Grinzig’s Paradisgasse. We were having dinner and the radio was on. A waltz stopped. The voice of Kurt von Schuschnigg, our Chancellor, came on: “German troops are invading our country, “ he told the Austrian people. We will not fight, not spill the blood of our German brothers. May God protect Austria---“ His voice faded away and the Austrian anthem sounded up. We put down our forks and knives. March 11th, 1938. Seventy years ago. A day of horror, of fear, terrible fear. Every day, every hour, nothing but fear. Hatred around us, Jews terrorized, dragged out of their apartments, friends and neighbors disappeared, signs saying Jews forbidden to sit on a park bench, Jews forbidden to go into stores, Jews arrested just walking on the streets. We were Jews and though it did not seem to matter much before, now we were fugitives. Somehow we survived. In January 1939 we managed to escape. In the middle of a night we fled to America, without money, without speaking the new language. Austria, our home, had disappeared behind huge brown flags with Swastikas. From the trolley taking us to the train station I saw the buildings on the Ring: the Opera, the Parliament, the Stadtpark. Would I never see it again? Never? And now. In 2008, seventy years later, a new Austria invited us: the Survivors. What for? To say that they are sorry about what happened? Sorry for the six million who were killed? Sorry for the thousands who found new homes in places all over the world: the USA, Israel, South America, the United Kingdom? Then I met Kimberly Harris. Kim is American but she had lived four years in Vienna teaching English. There, she became interested in the project “A Letter To The Stars” and had become part of it. Kimberly told me about the project and the people who were running it. Her major at New York University was “The Holocaust and Austria.” In her studies she was always working against hatred and prejudice. She told me about the thousands of young Austrian students who wanted to know what had happened before their time. They wanted to meet some of the Survivors. Actually, the year before thirty students came to New York with some teachers, I met Karina, a lovely sixteen year old student, and her teacher, Josef. They came to visit me. We liked each other at once. They were warm and very friendly. Karina studies Kindergardenpädagogik in Bakip-Mureck, Austria. We exchanged many emails about our lives and soon she started calling me “her Grandma in New York.” Kimberly told me that Karina would be my host in Vienna if I went. She would be one of the many volunteers among the Ambassadors of Remembrance. Kimberly told me many students in Austria had been working to research and document individual biographies of the Austrians who were murdered and the exiled survivors. I thought of my own grandmother who, at 87 years old died in Theresienstadt. Don’t I owe her something in remembrance of her since I never even could have said goodbye to her? “What do you think?” I asked my daughter. “Let’s go!” she said. I asked my grandson, Larry. “Let’s go!” he said. And so, on April, 30th, 2008, my daughter, Lisa, my grandson, Larry and I found ourselves on Austrian Airlines flying from New York to Vienna. I still felt uneasy. Would I be overcome with my memories? It was snowing that night when my husband and I fled Vienna with our baby in my arms. We threw the keys to our house over the gate and left the city, fully aware that we had no money and very little knowledge of English. Now, on the plane in May 2008, the plane was full of people I didn’t recognize. Lisa and Larry sat across the aisle from me. The airline personnel were especially friendly, dinner, even breakfast was very good, very Austrian. Drinks, juice, tea or coffee were offered continuously. Still, the closer we came to Vienna, my nervousness returned. How would it all go? I kept thinking of the special Memorial Event that was to take place on the Heldenplatz, the enormous place Hitler used to give his momentous Anschluss speech with thousand upon thousands of Austrians jubilating while those people who had no reason to celebrate sat in their homes cowering and shivering. And now with so many former refugees congregating there, wouldn’t there be some neo-Nazi protestors? Traces of the old fear threatened to overcome me again. Schwechat. Here we were! The members of A Letter To The Stars were here to greet us. With wide warm smiles, held out hands, even a bowl of Mozart Kugeln. With their help we breezed through customs. Buses were waiting to take the visitors to their hotels.Since it was too difficult for me to take public transportation, we stayed at the Hotel Kaiser Elisabeth which I knew form former visits and which was at the center of the city. A driver from the hotel picked us up. The familiar streets. Home. Did I feel like “Home?” I guess it did, this time it really felt like Home. Two letters of welcome greeted us in the hotel. One was from the Bundeskanzler, the Federal Chancellor, Dr. Alfred Gusenbauer, welcoming me by name and saying that it was a pleasure for him to be permitted to greet me here in Vienna after all the hurtful experiences that my family and I had endured. He said he was honored by my visit and that it showed how Austria is a part of my history and identity. He went on to say that the Austrians were aware of their historical responsibility for the injustice of the past. He welcomed me to the new Austria that has learned from history that they must be a country that distances itself from all forms of anti-Semitism. Austria is now the homeland of many religions, confessions, ethnic groups, and cultures and celebrates the wealth of diversity. He said it is this changed country that welcomes you and your family. The second letter came from Mag. Barbara Prammer, Relublik Österreich, National Direktor and Präsident. It had similar words of greeting. Both of these letters brought tears to my eyes. Included in the folder were announcements of all the sights, museums, theaters and the like, that were available to the visitors for reduced prices. The first evening in Vienna. Before coming to Vienna, I had phoned my personal friends in Vienna to tell them when I was arriving. My grandson, Larry, had been in Vienna twenty years before, at an action from the Jewish Welcome Center and the Government. They had invited one hundred Grandchildren from survivors in America, encouraging them to get to know the country of their grandparents. About one thousand Austrian families volunteered to be hosts to those young people. Larry’s host family was the Smejkals. They had a son the same age as Larry who spoke English. We became friends over the years and I saw them several times when I went to Vienna on my own. Herr Smejkal died some years ago, but Fritzi Smejkal was excited to hear that we were coming and marched to the hotel almost as soon as we arrived. It was a very touching reunion from the time when Larry had stayed in their Kabinett. I might add that Larry is now the Father of four little girls and Martin, Frau Smejakl’s son, is also long married and has two little boys. They had later some occasion to spend some time together, almost like relatives. Coming to the hotel was also my translator for many of my books that were published in Vienna, Christa Mitscha-Maerheim. Our friendship goes back thirty-five years. We had dinner together at the White Rauchfangkehrer. The next day, May 1st. There was a big welcome dinner at the Parkhotel Schönbrunn. How strange. So many years ago I had my wedding dinner at that same hotel since we had lived in Hietzing near by. Would I have a nervous breakdown there? Actually, no. I barely recognized it and expected it to be much larger. But of course it was painted yellow, the Imperial colors. I recognized the Hietzinger Platz, the U-Bahn station, the church, the surrounding benches. I described it in one of my novels. Vienna appears in most of my writings repeatedly. The dinner was spectacular with hundreds of people and very moving speeches in an elegant setting. “Never again!” was the main topic, referring to the awful past. I met Petra Kuba there. She is the director of the Maria Montessori School where I was to give a talk in a few days. All of the invited survivors were going to give talks in the various schools about their experiences. Since Karina was studying in Steiermark, it was not possible for me to go there to speak. Instead, Kimberly arranged for me to talk at the Maria Montessori School because as a child in Vienna so long ago, my school was The Freie Schule (The Free School), a school that used the Montessori method, a method that had a lasting affect on my own life. Maria Montessori was born on August 31, 1870 in Italy. She was a physician and educator. The next morning, May 2nd, there was a tour guided by students of the “Belvedere” from 8 a.m. - noon. It is the only place where one can see the Klimt’s original “Kiss.” Lisa and Larry went on the tour, while I had an appointment in the hotel with Petra Kuba, the Director of the Montessori School to discuss my talk there on Tuesday morning. I was looking forward to it and wondered whether it would have any similarity to my first school in Vienna. She arrived with a big bouquet of lilacs and a box of Sisi chocolates. In the evening a visit to the Synagoge at Seitenstettengasse with dinner was offered, but we were invited for dinner at Dr. Robert Streibel, the Director of the Volks Hochschle Hietzing, my host three years ago at my 90th birthday and the large exhibit of my life there. 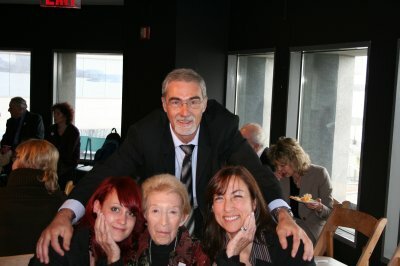 It was lovely to see him, his wife, Ingrid, and their seventeen-year-old daughter, Valerie. Dinner was delicious and it felt almost like home there. Robert picked us up and bought us home to the hotel. The next day, May 3rd, my publisher, Kurt Stellfeld drove up from Munich and took us at ten o'clock in the morning to the Montessori Schule in the 15th District. It was a beautiful modern building and Dr. Kuba expected us. She took us to the large conference room where about fifty students waited for us. There were girls and boys about seven to fifteen years old and they could not have been more attentive to my talk about my own Montessori School in Vienna so many years before. Afterwards, there was a question period. They asked me about my parents and my husband, what happened to them and about my arrival in America and the first years there. “Are you Jewish?” a boy asked me. This seemed to satisfy them and I was impressed to find out that in the Montessori Schule, religion is not an issue. The children learn what they chose to learn and they leave their shoes outside the school and clean up only at the end of the week. It all was very much like what I myself learned so many years ago in Vienna. I told them that in the many discussions about the pain of the survivors, it never was discussed how difficult the lives of the children of the survivors has been. They grew up in a country that was not the one of their parents. It was confusing to have German spoken at home but outside the house and at school it was English. It was difficult to explain this to children. And of course there was also the food. Wiener Schitzel, Kaiserschmarrn, Schinkenfleckerl, and Sachertorte were things other children did not get at home. As well, there was the fact that the parent survivors spoke English with an accent. I introduced Lisa to the children, who does speak German and also my Grandson, Larry, who does not speak German (but he can make a first- rate Sachertorte). They all laughed and we said a very warm goodbye. This was the event I really was concerned about. There was an event in the Parliament early in the morning which I heard was tremendously moving. It concerned the children's transports from Vienna at the time of Hitler, some only a few months old who never did see their parents again. I could not make myself to go to that. So we arrived directly at the Heldenplatz a little early in a taxi. A stage was set up for the program with a section for the Survivors in front of ten thousand people. Each seat had a rain-cover. Water and juice were passed around with sandwiches. 10.000 students from all over Austria were present. Several escorted survivors gave some speeches of their experiences of the time. It was bitter cold and I shivered. Suddenly, a man stood before me and gave me a big hug. It was Josef, the teacher who had been in New York the year before. He had driven three hours to see the event and me. “You need a guardian Angel who has heard that Stella is very cold and needs help.” With that he pulled a warm jacket from his backpack and put it on me. A real guardian Angel! 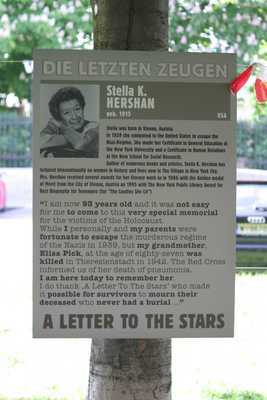 There were many touching speeches by the government representatives and of course by the Leaders of “Letter to the Stars.” Later we went to the park nearby to see the incredible posters of the 200 survivors with their stories and pictures. The students had made them and put them up. I could hardly keep from crying when I discovered Lisa's baby picture, her current picture, my own picture and life story, and also the story of my own grandmother who died in Theresienstadt at the age of eighty-seven. In retrospect, I am so glad I came and must thank Kimberly who convinced me to go and then made it possible. Since I am very old now, I am also thankful that Lisa and Larry have that memory of Vienna together with me at that fabulous Memorial for the Holocaust. Also Josef, the man with the jacket, came to the hotel with his wife. There was still time to do a trip to Baden by Wien: a beautiful little spa where I often spent time with my grandmother in my younger days. I had spoken often about it and Lisa wanted to see it. Oh, I also had a visit in the hotel from Alexander Gahaut, the man who wrote my literary life story for the Wikipedia, an interesting man who has eyes that see things other people do not see. He brought me a present which no one has given me before, a WIENER ZEITUNG, from February 7, 1915, the day, Stella Kreidl, erblickte die Welt. I never knew that I was born on a Sunday.